Cool Jerk » Archive » T.C.B. A couple weekends ago Darlene and I attended my 25th high school reunion in Carson City, Nev. This is the first one I’ve been to since the 10th in 1996 (I didn’t know there was a 15th, and I missed the 20th in 2006 because it was the same weekend as San Diego Comic-Con). It was a lovely affair, and I got to meet up and reminisce with many friends and former classmates, and even finally meet a few face-to-face for the first time. The festivities— ranging from a barbecue at Mark Funke’s home to golf and meet-ups at bars and restaurants— started Friday afternoon and lasted through Sunday. We only had time to socialize on Friday. It was a lot of fun and doubly so to introduce Darlene to many kids (yeah, I know we’re all in our early forties… it’s a habit) I used to see in classes and pal around with. A couple kids (Wendy Johnston and… oh, jeez I forgot!) mentioned they still had my first business card from when I was a senior. Wow! How cool is that! Darlene hadn’t even seen that one before, so she suggested my next blog post should showcase my freelance business cards. 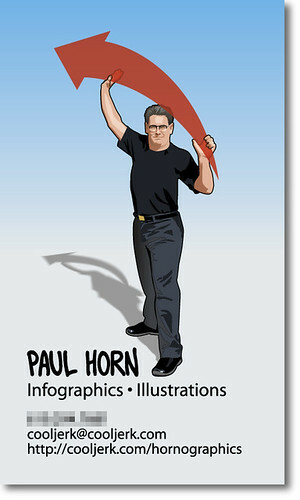 Ironically, I did get freelance work using this card. Go figure. Here’s my first freelance business card, from my senior year. “86 RULES, DUDE! !” Can you tell I didn’t have access to a Macintosh?? This little beauty was created with a Sharpie marker (a dull one, by looks of it) and was likely created in less time than it took for me to write this paragraph. These are so old, photo retouching was done with Aldus Digital Darkroom! 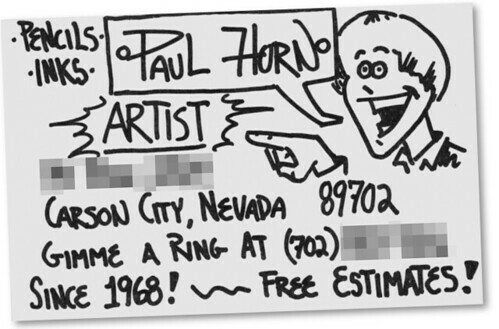 I like to think I had other freelance business cards during college… but I did not. I probably used one of the business cards I created for the UNR Sagebrush newspaper staff, which also had a self-portrait on it. 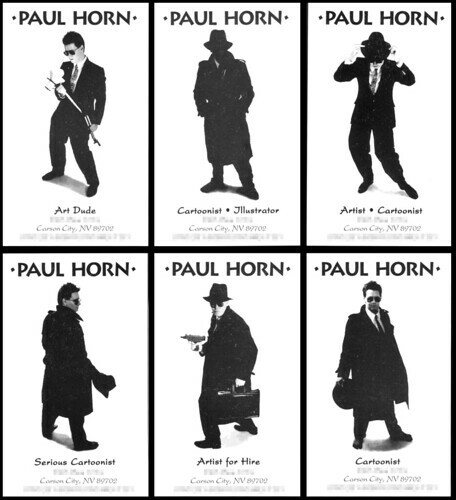 Regardless, here’s a set of six freelance cards from 1990 (photos taken by Greg Moyle). Boy, those red acrylic arrows are heavier than they look! When I moved to San Diego in 1994, those cards became obsolete. I didn’t have freelance business cards until I started professionally exhibiting at San Diego Comic-Con in 2003, and I would just use Cool Jerk cards (reminder to self: do a blog post showcasing all those cards). But after I quit The San Diego Union-Tribune in 2006, I realized I needed a card that showcased my mad infographics skillz, yo. So that’s when I created the current card. Oh, you’ve got cojones– putting up that first business card. Hee hee hee I actually really like these cards, PH. Very cool! What, didn’t they have hair gel in 1986?? That arrow looks might heavy — you can kill someone with it! I couldn’t resist commenting! Those b&w photo cards are pretty damn cool. Pre-Photoshop you say? ?